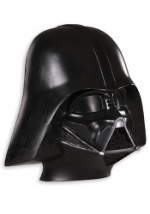 Our deluxe child Darth Vader costume will have you crushing the Jedi in no time. Channel the Force as this Sith Lord in the black jumpsuit with attached collar, chest piece and boot covers. A black cape, 3D belt, and Darth Vader 1/2 mask are included. Grab some extra Star Wars accessories like Darth Vader gloves or a Darth Vader lightsaber to prove you are the mightiest Sith around this Halloween!